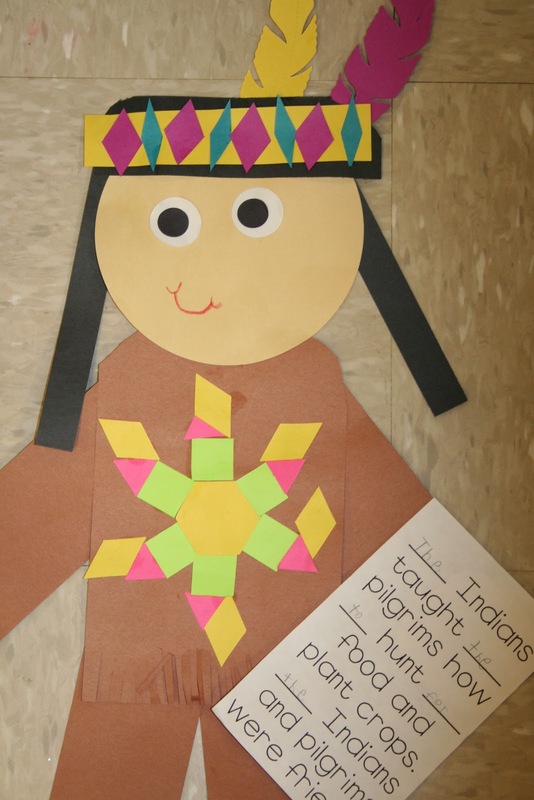 Mrs. Lee's Kindergarten: Thanksgiving Fun and a FREEBIES! Well, it was a short fast week for us! We managed to throw in some fun centers! 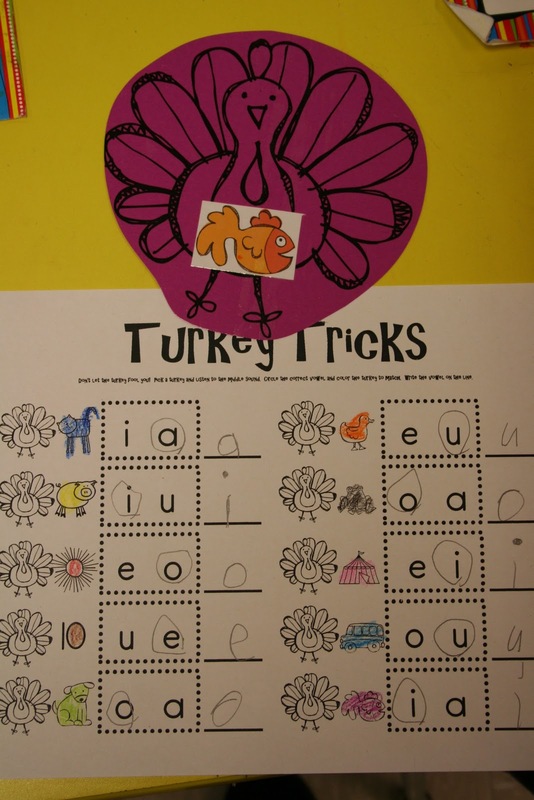 These centers you can find in my Happy Thanksgiving Pack at my tpt store. 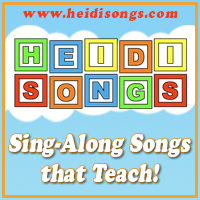 Keep reading for more ideas and a couple of FREEBIES! Teacher Tip: Instead of paper clips which always get pulled off from the fishing pole, just simply staple the corner of the game piece and it works perfect! Easy peasy, lemon squeezy! This sheet is a FREEBIE for you at the end of this post. This is under my reading loft...the kids lay under it and "look at the stars" then they can write the words they read...it's fun because it dark under my loft so it creates a "nighttime like" feel! My Gingerbread Unit is almost done! Adorable as always!! Can't wait for the gingerbread unit. I can't believe it is almost Christmas season!! 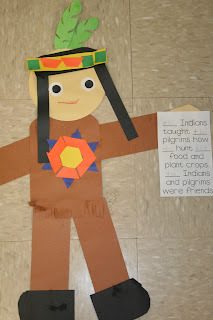 I love the centers and especially the Indians. Is the pattern for them in your Thanksgiving pack? Our letter next week is I and that would be a really cute project to make! I LOVE your Thanksgiving unit! We will be doing the center activities next week. Thanks for the freebies - the kids are going to love them! Thanks for the great freebies! Love all of your activities! I love the Thanksgiving fact book. I've been busy preparing the Thanksgiving centers. My children are going to love them. Please consider selling your Thanksgiving fact book. I would love to have it. 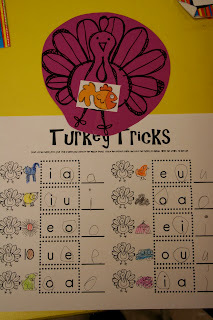 Using Catch that Turkey tomorrow...off to make the alphabet turkeys. Thanks for sharing! Love the freebies! Thanks! I love that your Thanksgiving fact book has blanks with sight words to fill in. I have the book from Kinderlit which I love, but I am thinking of switching to yours so we are practicing with the sight words! Is it in your packet? The book isn't in the packet. It's mainly die-cuts from my school...it was adapted from the kinderlit book as well. I changed up some of it so that's another reason it isn't in the packet. :) Thanks for visiting! Love, love, love your blog! Thank you for sharing your awesome ideas!! Your freebies are the best! I am so excited about the starry sight words idea! I have the perfect spot.. a square table that I use for my in and out students to my Spec Ed Resource/ self contained multi handicapped class! It has a skirt around it and I have some awesome neon paper that glows! Thanks!! Thanks so much for the freebie! I can't wait to try them out with my K's!! Love your blog!! I am thankful for you and your ideas! :-) Have a peaceful and restful Thanksgiving break. 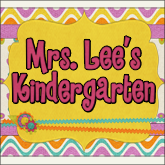 From the other Mrs Lee Kindergarten teacher! I LOVE your blog! Thanks for sharing! I purchased your November intervention pack. I hope you're getting one ready for December! I'd love to buy a new one every month! Thanks!!! LOVE your blog! I also loved your Thanksgiving Unit! Can't wait to see the units for December! Thank you for the freebie ... love all of your ideas! I purchased your Thanksgiving unit and I am LOVING it!!! I can't wait to do the stars under the loft idea. Thank you so much for sharing the turkey fishing game. I love it!!! Where did you get the fishing poles? Love this idea!! Thanks for always having great ideas. A giant thanks for the freebies! Can't wait for the Gingerbread unit! We are loving your November Small group intervention unit you posted! 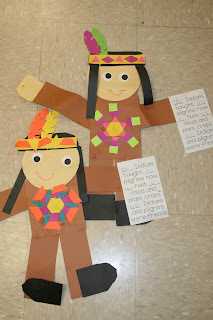 Will you be posting a December intervention small group unit soon too? Thank you so much! So many wonderful ideas here! I know it's a crazy time of year to be buying a Monster Unit, but I saw it on Pinterest, followed the links until I found it on TPT, and it finally led me back to you! And what do you know- I already follow your blog, LOL! I really liked what I saw online, so I bought your Monster Unit. I wish you would enable the email feeds for your blog (or maybe you have already done that, and I just don't see it?) because that would remind me to come check out your great ideas!) When blog updates don't wind up in my inbox, I forget to check them! Anyway, I love your ideas. Keep up the great work! If you ever want to trade products, just let me know! Can you please tell me what brand of fishing pole you used. I love the fact that it is round. I loved all your activities. Thanksgiving is a time to gather around loved ones ...to be grateful for all that we have been so abundantly blessed with and also to spare a thought for those not so lucky. It is a season of bountifulness and a reason to share the same ....true Thanksgiving is in actually doing that - Giving ! !